🏠 » » Amplify WiFi, antennas, adapters, repeaters and Router » The four types of directional WiFi antennas and the maximum range of WiFi signal. In several posts we talked about the different types of powerful USB adapters, how they work and their characteristics. 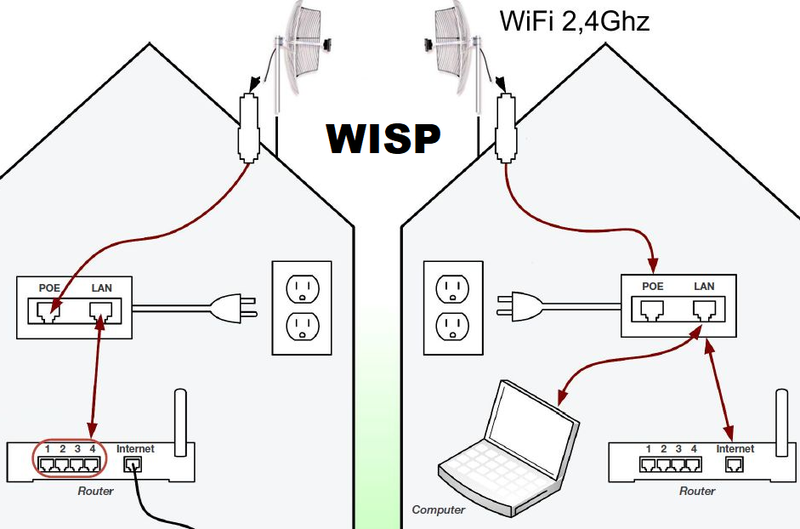 In all WiFi connections two elements are involved that determine the range and quality of the connection. The type of WiFi chip and its infrastructure determines the transmission speed, the frequency of 2.4 GHZ or 5GHz, the compatibility, etc., but another very important factor in the case that we want to establish a WiFi connection at a long distance is the design of the antenna. To be able to go further with the WiFi signal we will need a directional antenna. The distance you can reach is always in relation to the size of the antenna and the angle of coverage in which you receive. What are the best WiFi panels and directional 2017? There is no precise answer to which antenna is better than another, it all depends on the use that we are going to give, since those that have a more closed angle are more directional and go farther, so that we will not be able to see the WiFi networks that remain outside that angle. On the contrary, small directional antennas have a more open angle, they can see all the networks in the environment, but they won’t get as far as the most profitable. 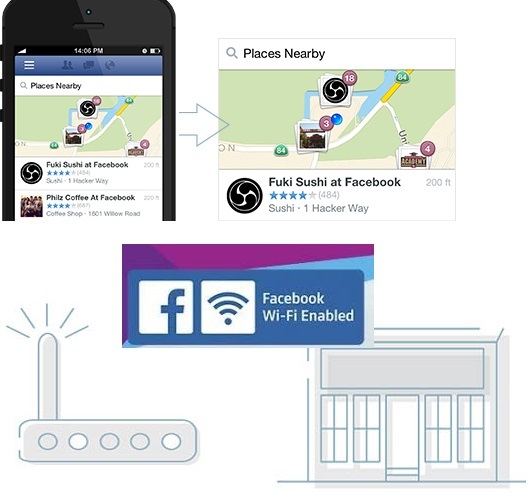 Do you need to connect to public WiFi which is free, but it is far from home? Keep reading and you’ll probably find a way to get it. Buy here Antenna Panel 36 º of opening Melon N519. 37 EUR. FREE SHIPPING!!! 1. The three requirements for remote WiFi links. 2. How wireless directional antennas work, antenna types, aperture angle and range. 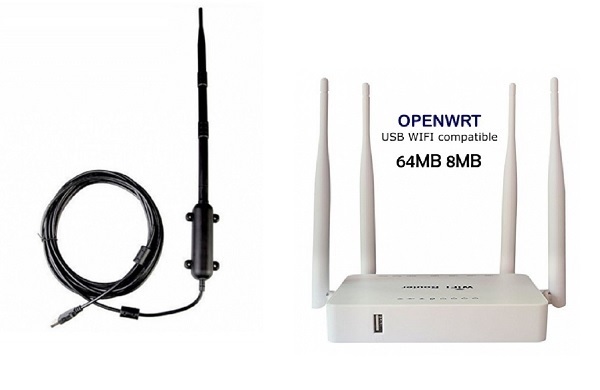 To establish a long-range WiFi link you always need to meet 3 basic requirements. The WiFi signal can easily traverse thin walls or isolated trees, but it is more difficult to cross an entire building or a forest. With the distance there are losses of packets of data, that if we add other types of difficulties can produce the connection cut, for this reason the three requirements essential for a connection to long distance. 1.3 Directional antenna oriented and directed towards the WiFi transmitter. The directional antennas emit and receive WiFi signal in a single direction, so it should be oriented to that side. The smaller the aperture angle the more accurate the orientation should be. The panel antennas do not need an exact alignment, but the Yagi and parabolic panels do need to be aligned as accurately as possible. If you need to make an accurate orientation of your WiFi antenna. In this other post we talk about the various techniques of orientation and alignment of WiFi antennas. These requirements are indispensable, first of all, if there is no direct line of sight and for example we have a building in front or a mountain you can not establish the long distance connection. And on the other hand the type of WiFi directional antenna is also determinant. With a small Panel antenna between 7DBI and 36dbi we will reach 300 or 500 meters as they have a very open angle. 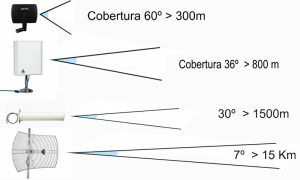 For more distance between 1 km and 15 km we will always need a antenna of type WiFi antenna Yagi or parabolic with a more closed angle. To create a wireless bridge or per to per-link we will use the directional WiFi antennas. 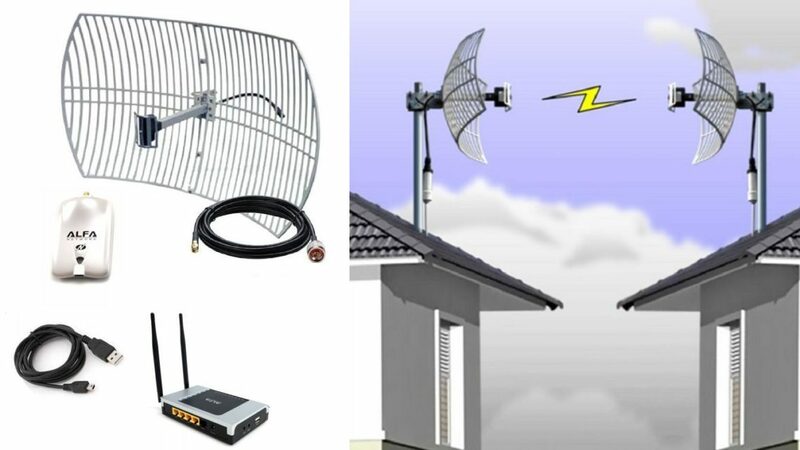 The antennas are manufactured in different sizes and shapes and can be used both inside and outside or outdoors. Next, we will describe the four models of directional WiFi antennas designed to connect via WiFi at a long distance. The directional WiFi antennas or directives are those that by their design can direct the whole frequency pattern to a single direction. A directional antenna receives and emits the WiFi signal forward, and also has a more open or closed angle in order to get even farther. The relationship of the opening angle with the distance it reaches basically allows it to lower angle more reach. The graphical way to see it is compared to a light bulb. A bulb without spotlight emits the light at an angle of 360 º illuminates very well closely, but has very little range in the distance. 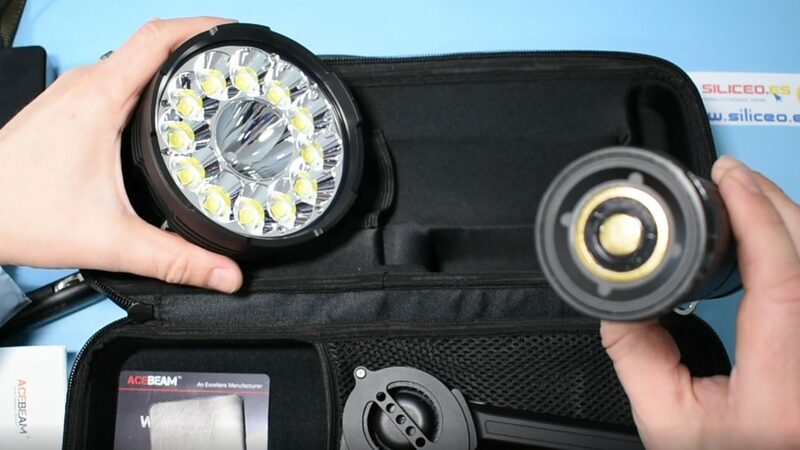 The focus of a flashlight or a car headlight concentrates all the light at an opening angle of 30 º allowing to go farther, if we reduce the angle even more up to 10 º The REACH increases more, but we will not see anything on the sides. 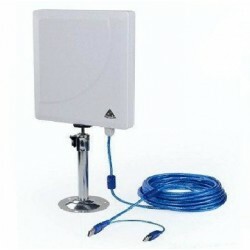 2.1 Antenna WiFi Mini Panel Alfa APA-M04 with an opening angle of about 60 º is very practical for indoor use. 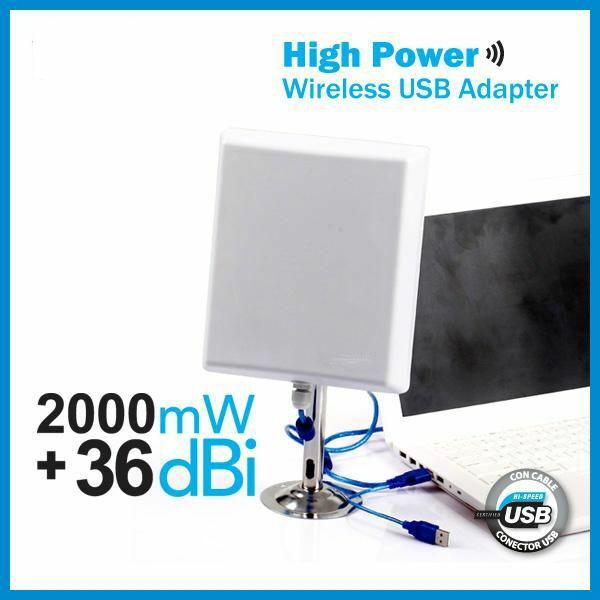 It is a directional antenna with a very open angle to be able to see all the WiFi networks of the environment and a range of up to 300 meters with very good quality. 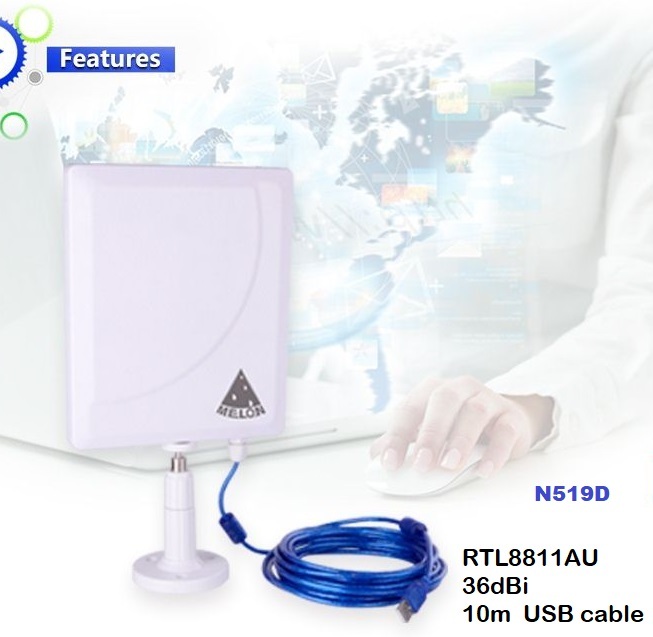 Buy Here ALFA NETWORK APA-M04 7dbi. €8.90 FREE SHIPPING!!! 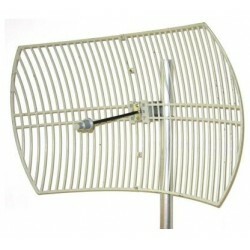 2.2 Long-range Panel antenna Melon N4000. With an angle of 35 º You can locate the nets that are located outside the house to an incredible distance of 800 meters. It is completely waterproof and can be placed outdoors under rain and sun. It is the most used model for long range because its size is manageable and very easy to install. 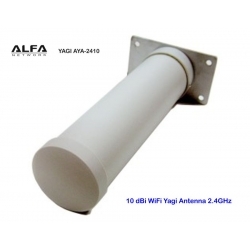 2.3 Antenna Yagi Alfa Network AYA-2410. It is a professional model with a very closed angle of about 30 º. Its installation is a little more complex. It is recommended to connect to very distant networks, but it is necessary to point it quite accurately. 2.4 WiFi parabolic antenna grid. By design the parabolic grid will always have a very high gain and also a very narrow beam width that makes it the favorite among professional installers of WiFi antennas. Buy Here ALFA NETWORK AGA-2424T 24dbi. €81 FREE SHIPPING!!! The WiFi parabolic antenna model is the best long range antenna for point-to-point links (PTP per to per). 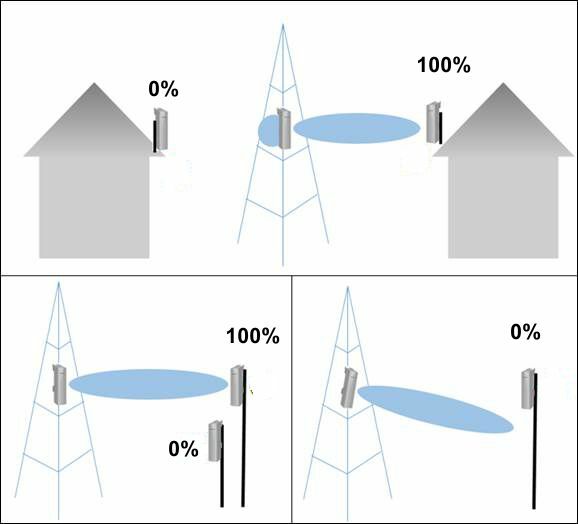 This is the model of wireless directional antennas for long distance necessary to carry WiFi signal in the field or in the rural world, to take the wifi of the municipal councils of the municipalities and take it for example to the domestic users that need to transfer a Signal from one specific point to another. 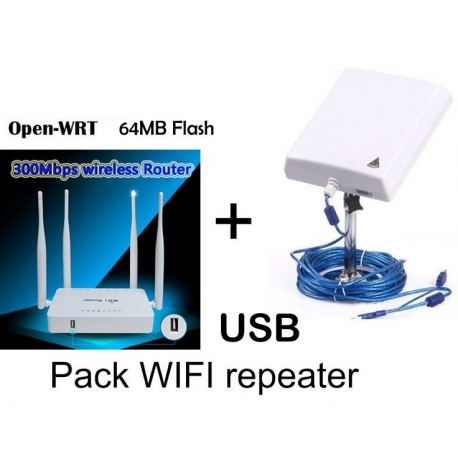 The WiFi satellite is ideal for someone who uses the simple WiFi repeater to focus on the signal source, as well as for someone who wants to use a combination of two access points to create a link “back Haul link”. This AGA2424 parabolic antenna is the one that uses telecommunication services to carry internet via WiFi to clients using the technology of WiFi backhaul. This technique basically operates with the principle of a chain link that transmits point-to-point data to a central station that provides the service. 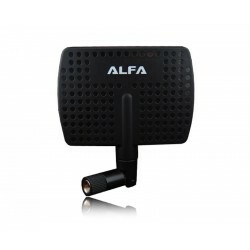 In order to support the long-range WiFi connections in open spaces, the popular Alfa Network brand has improved in 2017 its models of grid antennas AGA series, with designs for both 2, 4Ghz and 5GHz. The most used model in the frequency of 2, 4Ghz is the Alpha AGA-2424T which stands out for the fantastic range and the ability to transmit high-speed Internet through long-range links. The first installment presents the only drawback that is the need to orient it correctly. With an angle of only 7 degrees of aperture can cause great differences in signal strength, quality and speed if we do not adjust within that angle. The grid design is designed to allow the wind to pass and does not affect the signal performance. There are WiFi antennas of parabolic grid in both 2.4 GHz and 5GHz. Be sure to choose the frequency type of your link point-to-point, as each type of antenna will only work on the designed spectrum. Buy here Parabolic ALFA NETWORK AGA-5828T 28dbi. €68 FREE SHIPPING!!! AGA2424T 2.4 GHz works on 802.11 b/g/n 150 Mbps/300 Mbps protocols. 5GHz works on 802.11 n/A/AC/AC2 protocols with speeds between 300Mbps and 1.3 GBPS. 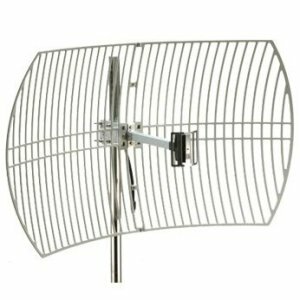 A inexpensive WIFI dish antenna can be built from satellite TV antenna. the reflector can be found in electronic stores.